Dirt, dust and greasy fingerprints make screens difficult to read and may lead to headaches, eyestrain and cause wrinkles in the delicate skin around the eyes. 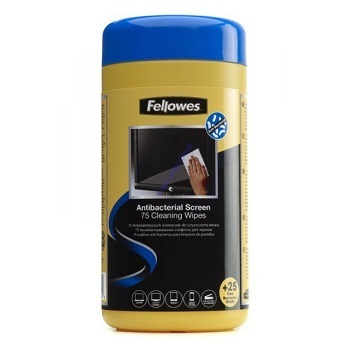 Protect yourself by using AF screen cleaners. They are all anti-static, non-flammable, non-smearing, non-toxic and OEM approved. Packs vary from pump sprays or tubs for large offices, to individual sachets and small packs for when you are on the move. All these AF products are safe to use on mirrors, lenses and OHPs. 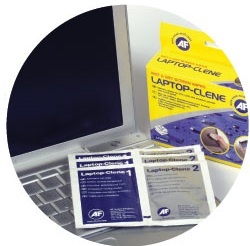 For cleaning plasma technologies use the AF Multi-Screen Clene range of products. Cleaning Tip: Daily cleaning with correct anti-static products will reduce dust and dirt, thus reducing one of the causes of eye strain. Anti-bacterial and Anti-viral Screen Wipes. Effective against germs and bacteria including MRSA, E-Coli, Listeria, Staphylococcus and Salmonella and effective against the H1N1 virus and H3N2 virus. Protects for up to 3 days. For use on monitor screens, screen filters, laptop screens and glass surfaces of photocopiers and scanners. Anti-static formula. Wipes are biodegradable. Minimal alcohol content is less than 1%. Tub of 75 pre-saturated wipes in a re-sealable tub.